LAUREN Ralph Lauren Swimwear Size Guide Enjoy the soothing sounds of ocean surf in this chic swimsuit. 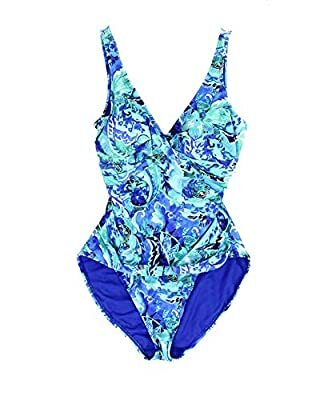 One-piece swimsuit in a colorful paisley print. Shirred side seams and a tummy-control design create a slimming silhouette. Wrap front boasts a twisted design. Fixed shoulder straps. Deep V-neckline. Scoop back. Removable cups and underwire for a supported fit. Moderate rear coverage. Fully lined. Body 1: 85% nylon, 15% elastane;Lining: 70% nylon, 30% Lycra®;Lining 2: 100% polyester. Hand wash, line dry. Imported. If you're not fully satisfied with your purchase, you are welcome to return any unworn and unwashed items with tags intact and original packaging included.